Life, as the unique vocation of each person, emerges as a central theme in the preparatory documents for the October 2018 Synod on Youth. His Holiness Pope Francis made it clear from the outset that he was asking the People of God to attune ourselves to the emerging voices of youth – those in the pews, those who have moved away, and those who never asked, or were asked, where God is in their lives. The responses of youth from around the globe, on social media, on-line, in assemblies, and in person, have been gathered and shared with the Church Fathers as matters that need attention even, and perhaps especially, when they call the Church to task for failing to be inclusive, to be “catholic”, and to live the good news. 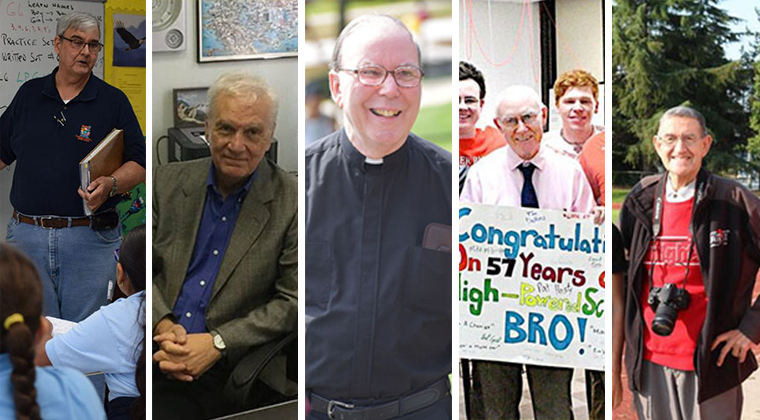 The five Brothers chosen for this edition of Profiles have made listening to youth, a wellspring of mission, spirituality, and life. Their current assignments have them scattered from coast to coast across the Edmund Rice Christian Brothers North American Province. Brother Dominic Sanpietro, CFC, is a counselor at Tampa Catholic on the west coast of Florida. Brother Arthur Williams, CFC, teaches in southern border city of Brownsville, Texas. Brother W. Owen Cassidy, CFC, ministers in the north west coast city of Burnaby, British Columbia. Brother Thomas Collins, CFC, serves populations on the south side of Chicago, and Brother John Johnson, CFC, teaches psychology at Iona College in the east coast city of New Rochelle, New York. Each has been called to open his heart to Christ present and appealing to us in those we are called to serve. To read the Brother's profiles click here.